Arpeggiators are amazingly powerful creative tools, taking the hard work out of producing rapid runs of notes that fit in with a particular set of chords. All you have to do is hold down the chords in question, or program them into your MIDI editor's piano roll, to have your arpeggiator step through their constituent notes rapidly in a predetermined sequence. The upshot is that with minimal input, you can effortlessly produce driving 16th-note basslines or complex, interwoven melodic sequences based on the chord you're currently playing. However, have you ever considered the potential of your arpeggiator MIDI plugins for triggering beats from drum machines, synths and samplers? The results are obviously unlikely to be conventional, but that's a good thing, right? In this tutorial, we'll show you how to use the Cream CM arpeggiator and Grooove CM drum machine - included for free with every issue (digital and print) of Computer Music magazine - although either can be substituted for your preferred arp and sound source, of course. For much more on getting creative with arpeggiators, pick up Computer Music 227, which is on sale now. Step 1: Using an arpeggiator to sequence percussion sounds is a great way to come up with imaginative new grooves. Start a new 120bpm project in your DAW of choice and import the audio file GroooveCMKick.wav onto a new audio track. This will provide a solid four-to-the-floor backbeat to our arpeggiated percussion groove. Step 2: Create a new software instrument track and load an instance of Computer Music's Grooove CM drum sampler onto it. 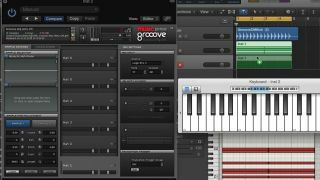 Grooove CM is a drum sample playback instrument that can house up to six drum or percussion samples, one on each of its six 'keys'. Step 3: Load a Grooove CM preset to fill the six keys with a set of six percussion samples - we've chosen the Techno kit. We already have a kick drum supplied by the audio file, so we tune the kick drum sample up by 12 semitones to make it more of a percussion sound. Make a note of the MIDI keys that trigger each of the six sounds - we've got C1, D1, D#1, F#1, B1 and C2 here. Step 4: On the Grooove CM track, create a MIDI region and program a MIDI note event for each of the six pitches triggering the drum sounds. Extend the length of each note to fill the entire region, effectively creating a long, six-note chord. This will tell the arpeggiator what notes to play. Press play and you should hear all the percussion sounds trigger together in one big chunk at the start of the region. Step 5: Now the fun begins! Insert a MIDI arpeggiator - we're using Cream CM - before the Grooove CM plugin. Hit play again and you should hear the percussion sounds cycling through as Cream CM arpeggiates the chord, generating a string of 16th-notes that loop around our six note pitches. Step 6: Experiment with the Rate parameter to adjust the speed of the arpeggio and, consequently, the frequency of notes in the groove. Because you're cycling around a set of six notes, this creates a variety of rhythmic patterns when looped over a 4/4 backdrop. Triplet patterns can produce especially interesting results. Step 7: Let's say we want to use these sounds to play a two-bar pattern of eighth-notes. To do this, set the Rate parameter to 1/8, and in the Pattern Controls section, click the Reset On New Note button. This starts the pattern from the top each time a new set of trigger notes is received. Snip the original four-bar triggers in half in the piano roll editor, so that the sequence triggers every two bars. Step 8: Duplicate this setup on a second track. For this instance of Grooove CM, load the supplied Grooove Arp Hats CM preset (with audio) - it's six acoustic hi-hat samples assigned to the same six notes used in the Techno preset. Copy the MIDI region to the new track, then set Cream CM's Rate to 1/16 to generate a hi-hat pattern that works nicely over our percussion groove. Step 9: Using Cream CM's Rate controls in this way can lead to some really creative and interesting rhythmic interplay between the two sets of sounds. For something really out there, try setting the hi-hats' Rate control to 1/8D to get a rolling, off-kilter groove. Combining rhythms in this way is almost certain to get you out of any rhythmic rut and inspire new percussive creations!